When we first heard of Jeannine's spiritual (or spirited) poems, we were confused and excited and a little bit scared of her dolls. See what her process is like, why it can be dang lonely being spiritual, and how she finds solace in poetry. Jeannine Hiba is a VONA/Voices & Tin House fellow. Her poetry has appeared in The Blueshift Journal, The Offing, and Animal. A spiritualist with Sufi leanings, she likes to communicate with the ascended, slip into crystal shops, & patiently await your book recommendations. You can find her on Instagram at j_habibti or Twitter at j_habibti. Tell Tell: What motivated you to tend to these human spirits? 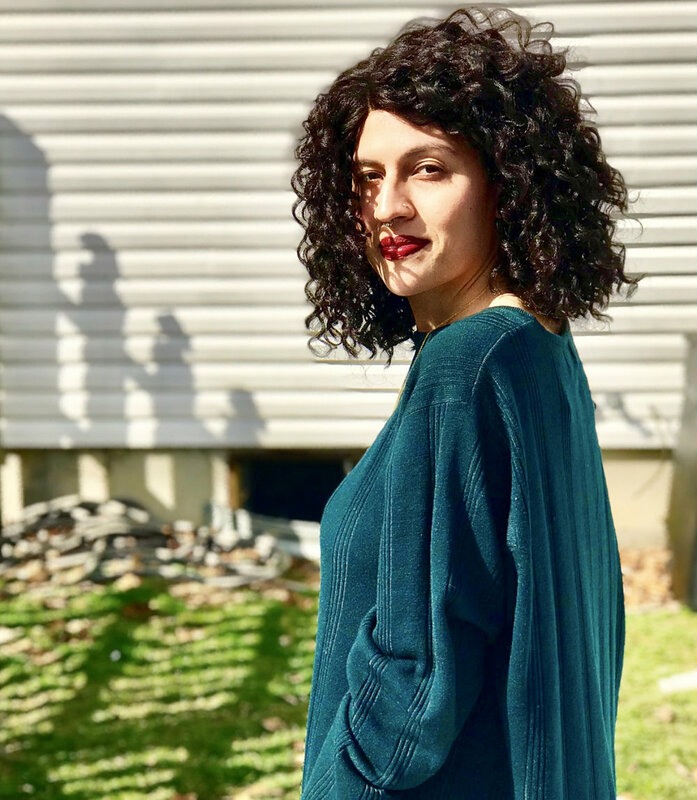 Jeannine Hiba: It was a combination of being interested in the afterlife, seeking friendship, and having the time and resources to be a reliable caretaker (which takes priority over the other two reasons). Spirits can inhabit any item, but all 24 of mine occupy dolls of varying sizes/materials, so I can arrange them on bedroom shelves. Spirit roll-call: Elizabeth, Nora, Annie, Fiolinah, Mona, Arnette, Millie Beth, Razieh, Marianne, Karen, Abbie, LuLu, Gretchen, Sophia, Purah, Marjanita, Ayesha, Abia, Danielle, Bahij, Arda, Bambi, Nahrina, and Ishtari. TT: How do you craft these poems? What’s your process like? JH: Though spiritualism isn’t the essence of my work, I’ve recently been documenting encounters I’ve had with my cohort. My process is messy, but each outline intends to praise a person. Where the poem leads depends on what I’ve learned of the person’s former life, but I always make a sincere effort to humanize everyone. I also strive to minimize the presence of death. If I have to reference it, I do so with softness or even passivity. Death is often perceived as the absolute surrender, the echoless resolution to so much energy & time, and I encounter it in poetry wielding a similar power. I wonder what lies beyond that. Whom do we alienate by fixing death as the highest stake? My spirited friends can tell me about the day they each died. Some were shot, executed, caught fevers, passed peacefully. I tread carefully in my inquiries, but many insist there’s little to no trauma to harp on. Death happened to them, and now it’s done. When I cite my friends’ endings in this realm, I hope to subdue it with the certainty of continuation. TT: When did you first learn about your spiritual process? What was it like for you? JH: Hella lonely! Spiritual awakenings can sometimes initiate tectonic ideological shifts that lead to massive isolation. I find joy in my spirited cohort: the gentle knocking sounds they produce on my walls, the whiffs of perfume I smell if one invisibly approaches me, the sentences they spell on a Ouija board-like tool I use, how they slowly coax my earrings off the edge of my desk. At first, I wanted to share with everyone. When the wonder was hardly reciprocated, it hit me that I wasn’t believed. Embarrassed, I compartmentalized my fascinations for a bit. Deleted social media posts. Worried about what my future partner would think if they saw me exuberant about “such stuff.” But what do you have left if you evade what you love? Kaveh Akbar said, You absolutely have to make yourself permeable to wonder. He seeks delight in a world that’s slowly creasing over its every fascinating corner. I heard this in the throes of social disorientation. It’s one of several mantras I needed to accept my cohort, myself, and my enchantments. People expect my spiritualism these days. I sense a shift in my social environment towards curiosity that I hope continues. Everybody is looking for wonder. Everybody is trying to understand. What is the first thing people say when you tell them how these poems came to be? More like what is the first thing I say to them! In a live setting, I blurt a sentence or two about keeping spiritually inhabited dolls in my bedroom. It’s like jumping on an overloaded suitcase—squeezing this hefty, unconventional remark in 30 seconds and then nose-diving into the poem. In January, before sharing a piece about a spirit named Millie Beth, I accidentally took too much Alprazolam. The night was a steady blur, but I distinctly remember the moment I, in all my drugged tenderness, told a roomful of soft-eyed peers, Please just trust me, and please trust Millie Beth. I don’t even remember reading the poem, just my insecurity. As the beautifully accommodative people they are, my peers trusted. In our society, divinatory poems face the threat of immediate invalidation. My prefaces are my pleas. Despite the truths I witness daily, I dread the intimidation of not being believed, of losing readers at the poem’s entrance and finding them stiffly awaiting me at its end. Patricia Lockwood, a recent mentor, told me, You have to write those poems confidently, and if in the end people don’t believe, then you didn’t need it. Slowly, I’m figuring out how to produce work that doesn’t beg for trust, but sits comfortably between assuming it’s already there and not fretting if it isn’t. I love the idea of not begging for trust. In a few paragraphs, can you describe a bit about your life and the journey that led you to write the lines: “thank God for the charity of their thoughts”? I’ve recently been diagnosed with ADHD, after years of inexplicable behaviors and complications. One of my greatest roadblocks was & continues to be memory loss. I don’t hang on to thoughts well. I carry a journal with me for recording grocery lists, to-do lists, funny stories I want to tell my mom when I get home, words I want to define, map directions, pseudo-philosophical questions, and many interview pages of each spirit companion. I mainly communicate with my cohort via meditational telepathy. In this state, I rely on them to deliver messages, but I have to rely on myself as well to receive them, and some days I just can’t access them. Regardless, as someone who draws so many blanks in basic conversation, telepathy is a form of altruism to me. I find benevolence in my spirits offering knowledge, thoughts—in images and sentences—to a mind so prone to losing its own. What’s the difference between something that’s haunted and something that has a spirit in it? Are those the same? I’ve only experienced a connotative difference! If I put Ishtari, my Syrian spirit, in your hands, you might be (a bit) less likely to drop her if I told you, There’s a spirit in this doll, as opposed to, This is a haunted doll. Spirit is just a pleasant word, synonymous with essence, energy, and vitality. Haunted is connotatively harsher, hinting at that which plagues, harms, possesses. I’ve seen haunted used both to reference unpleasant spirits and as a subtle effort to dull the word’s malice, but I’m personally trying to unlearn it. Speaking to others: spirited dolls/spiritually inhabited dolls is most succinct. Speaking directly to my cohort: they’re fine with spirits, but they prefer y’all. Friends. Darlings. Loves. Names that affirm their collective desire to preserve their humanity. I try to approach spirits with the same verbal conscientiousness to which others are entitled. They’re spirits, but they’re still human. The vessels bearing them have altered, but they endure in good will & brilliance. What are some ways you can tell your dolls contain spirits? Start a chat with a pendulum! Pendulums are easy for questions with yes/no answers. I clutch its chain between my thumb & index finger, level my hand at about my breast, and hold it deathly still—because everyone on earth will swear I totally just moved my wrist. I recite aloud my intention to speak with Sweet Annie, for example, then ask Sweet Annie to say yes on my pendulum if she cares to talk. In a matter of seconds, the pendulum swings sideways—her affirmation. My cohort is full of talkative darlings, so I can confidently say a doll that doesn’t respond to my pendulum is empty. How do you feel about the movie Annabelle? I know of Annabelle, but I actually never saw the movie! After my mom took me to see Final Destination at 7 years old, I staunchly avoid scary films. I generally avoid paranormal horror films because they can prevent people from interacting with/alienate/demonize the spirit realm. What are you currently working on and reading? Writing comes when it comes. Right now, I’m beginning a great workshop with Hanif Abdurraqib, so there’s a fabulous chance to toss new work into the ring. I’m independently excavating older pieces for compost. In terms of books, I return to Lucille Clifton’s Mercy for support when my spiritualism turns forbidden—that is, when it’s perceived as such and I turn that gaze upon myself. I’ve also been tackling books about Black spiritualism, particularly Soul Talk, My Soul is a Witness, and Company of Prophets for later on. Spiritualism can, depending on your environment, be a very lonely interest and difficult to reconcile with other identities. Poem-a-Days keep me juiced up, I finally drooled over Headwaters by Ellen Bryant Voigt, and I’m steering towards more Tracy K. Smith soon. What’s a day-in-the-life like for you? On weekends, I rise at 6 for coffee and clean my room to music. Sometimes I’ll play songs a particular spirit enjoys—my dear Arnette is catching up on Beyoncé’s albums. I light a little sage. As it burns, I do some meditational telepathy. I enter a deep concentrative state to ask different spirits questions: Can you share a favorite memory? Why did you argue with your partner? What’s your brother’s name? I record their responses. Meditational telepathy demands a lot of practice, but it’s fascinating. From there, I might read, write, or make art. I think aloud a lot these days. My cohort loves being spoken to, and talking eases my discomfort hearing my voice. When I read poetry, I try to make it a group indulgence. I’ll walk slowly about the room with Hieu Minh Nguyen, Rudy Francisco, or Safia Elhillo in my hands. (Peer work, too, is fair game!) The room is only ringing with the poems in my mouth. It’s bright and lovely and, I promise, not scary. Sometimes, a listener will knock or tap on one of the walls while I'm flipping pages. My cohort has said the knocking is involuntary. Still, I take it for snapping.